My daughter loved making this angel. She likes to remind up that she was an angel in the Christmas pageant at church and that she got to hold the special star. 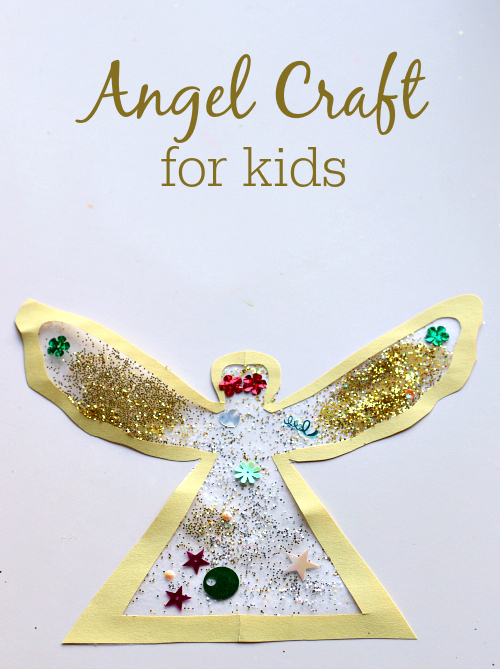 When I asked her what sort of Christmas craft she felt like making she suggested we make an angel and so I started thinking about how we could do that. 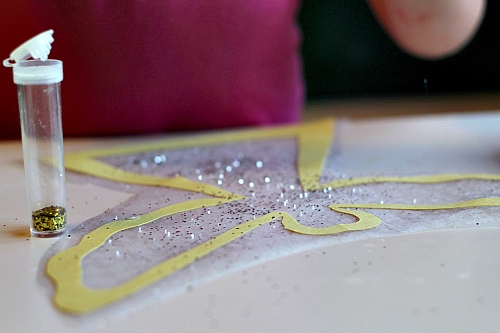 I settled on a sun catcher with glitter because I was thinking about how beautiful our nativity craft was last year. 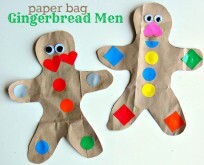 This is a great easy angel craft for preschool. Gather your materials. 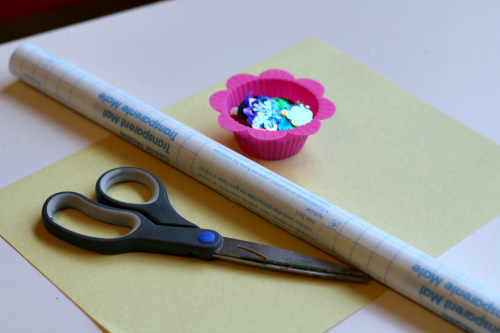 You will need some contact paper, card stock, scissors, sequins, and glitter. 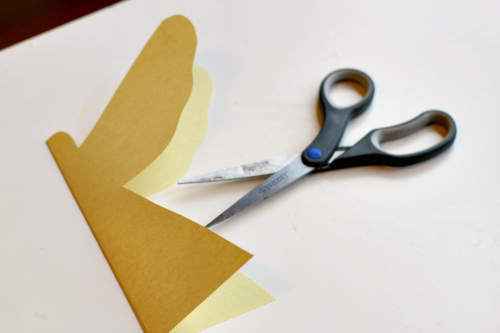 Start by folding your card stock in half and cutting out the outline of an angel. When I do this I will usually draw the item then cut it out, fold it around another piece of paper and cut the final version. I would be a big ‘ol liar if I said this angel was easy for me to draw. I think I did 5 before I had one I liked. The others ended up as scrap in our cutting station. Cut out the middle. 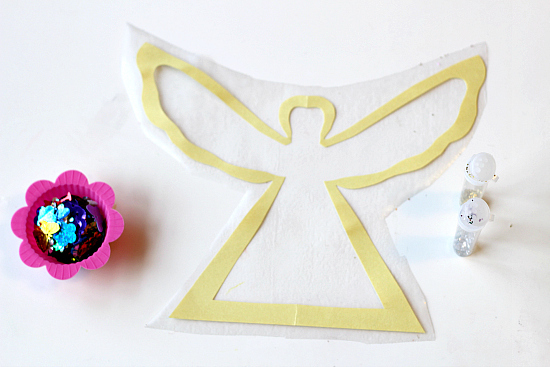 Peel the paper off the contact paper and lay the angel outline on top. Trim the edges and prepare the materials for your artist. Add a little glitter loving 4 year old and let her do her thing. Or his thing, my glitter loving 4 year old just happens to be a girl although her brother LOVED glitter when he was her age ( here is some proof) . 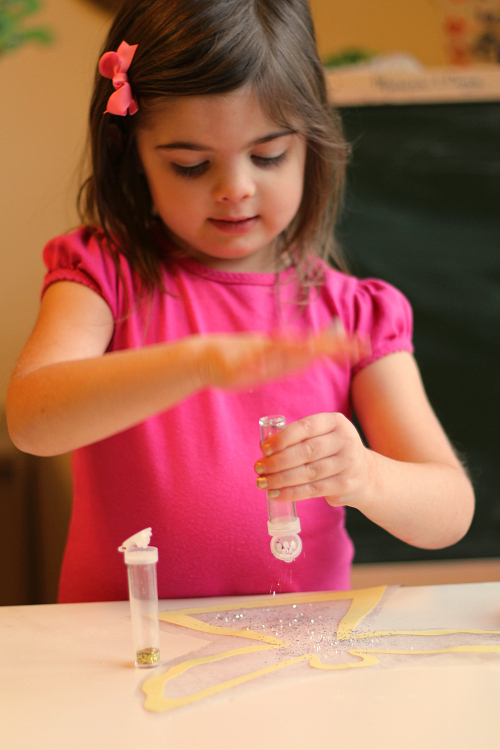 TIP : When working with loose glitter give your child only a little in a small shaker to minimize the mess. There will still be some glitter on your floor, in their hair etc… but it won’t be a huge pile that ends up everywhere for 6 months. Add sequins too. 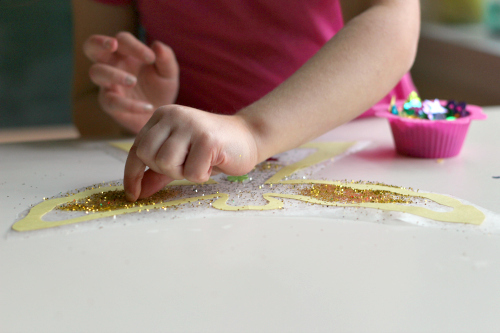 You could just do glitter but the real fine motor workout is in this step. It is VERY hard to pick sequins up and she has to coordinate a lot of muscles to do this. 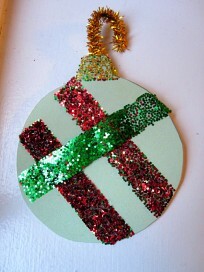 It also gives her patience a little exercise which was not required for the glitter. 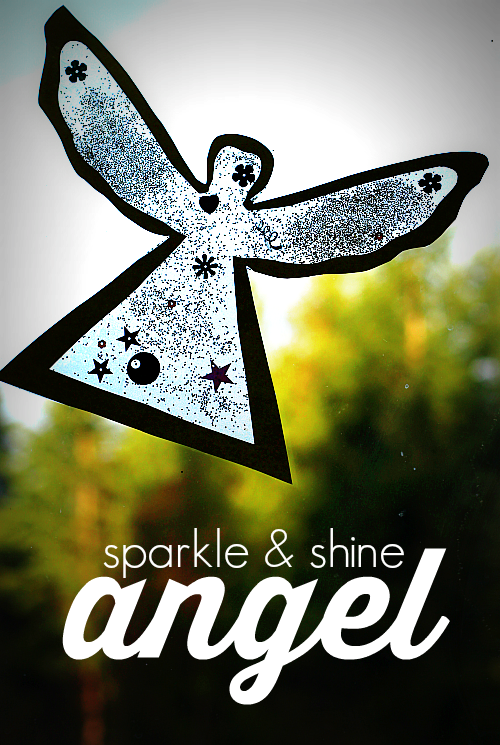 Give the whole angel a little shake over a garbage can to shake off any loose glitter. Hang it up. After we were done my daughter asked to color the left over angel shape so don’t immediately recycle that. Offer it up for some less adult directed creativity. 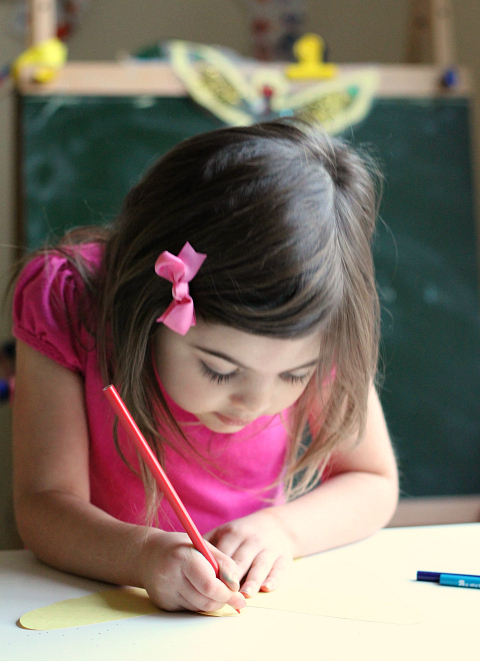 She drew a little but then asked if I would be a student and she could be the teacher and we ended up playing school. 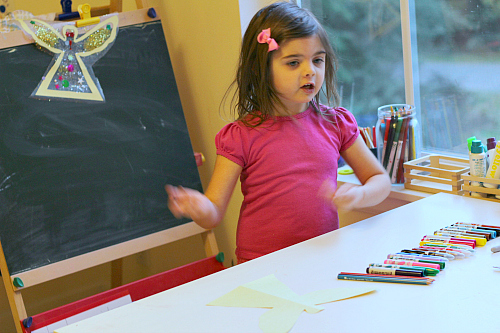 What I love about pretend play like this is how much she talks during it. 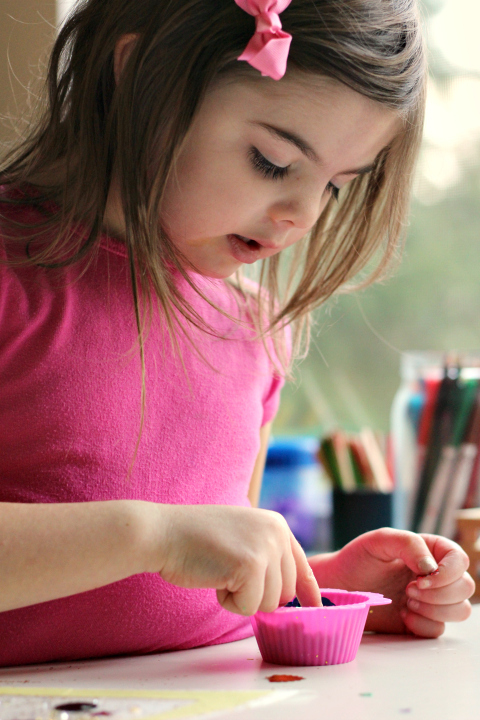 For some children my daughter included speech is not always a given and opportunities to work on oral language through play is always a gift. Find what gets them talking and run with it. For us that is by par pretend play. After the play was done I trimmed the angel’s contact paper even more and we hung her angel up in the window to watch over us. 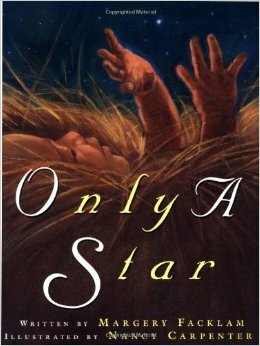 Only a Star by Margery Facklam is a calm beautiful book about the first Christmas. A little girl asks her dad about the decorations on that very first Christmas day and readers are reminded that the true origin of the holiday. The illustrations by Nancy Carpenter are stunning, they vary in perspective and unlike so many manger scenes, this one looks like a mom and a baby. They gave me chills coupled with the simple but profound text. A great holiday read . Who Is Coming to Our House? by Joseph Slate is a sweet look at the animals in the manger preparing for Baby Jesus”™ arrival. 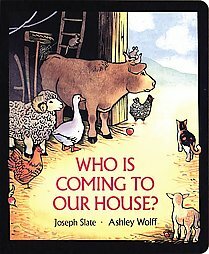 The animals aren”™t sure who is coming but at the insistence of the mouse, they clean and prepare the manger until finally a very pregnant Mary on a donkey with Joseph by her side. The next page is probably my favorite image of the Baby Jesus image in any children”™s book. Mary”™s hair is down, feet bare and Joseph is protective by, the animals are watching and alert. Illustrator Ashley Wolff does a perfect job with this simple but fantastic book! Room for a Little One: A Christmas Tale by Martin Waddel is another peaceful sweet book that gets to the heart of the nativity story. The story here is really about how the stable is a welcoming place to be and how Kind Ox shares his space with all who need refuge. The dog tells the cat that he won”™t chase her, and the cat tells the mouse that he will be safe in the stable. It”™s clear that this stable is a place for all no matter what. The symbolism is obvious but lovely and not sugary sweet. Kind Ox is showing us all how open doors and open hearts can change the world. I love this book and plan to buy it for my own bookshelf. I’m so going to do this with my daughter. She will love it! I love “Room for a Little One.” It’s just precious.